†Randomized, double-blind, placebo-controlled, fixed-dose trial with a 30-day follow-up period. Sample sizes shown represent the All-Patients-as-Treated (APaT) population (N=403). *All-Patients-as-Treated population: SAPHRIS 2.5 mg BID, n=104; SAPHRIS 5 mg BID, n=99; SAPHRIS 10 mg BID, n=99; placebo, n=101. Primary endpoint was the LS mean change from baseline to Day 21 in YMRS total score in the full analysis set. Click here for full study design. Primary endpoint was the LS mean change from baseline to Day 21 in YMRS total score in the full analysis set. Click here for full study design. Day 21 in CGI-BP overall severity of illness score in the full analysis set. Elderly patients with dementia-related psychosis treated with antipsychotic drugs are at an increased risk of death. SAPHRIS is not approved for treatment of patients with dementia-related psychosis. Contraindications: SAPHRIS is contraindicated in patients with severe hepatic impairment (Child-Pugh C) or known hypersensitivity to SAPHRIS or its formulation components. Reactions have included anaphylaxis, angioedema, hypotension, tachycardia, swollen tongue, dyspnea, wheezing and rash. Cerebrovascular Adverse Events, Including Stroke: In clinical trials with antipsychotic drugs, elderly subjects with dementia had a higher incidence of stroke (including fatal stroke) and transient ischemic attack vs placebo. SAPHRIS is not approved for the treatment of patients with dementia-related psychosis. Neuroleptic Malignant Syndrome (NMS): NMS, a potentially fatal symptom complex, has been reported with antipsychotics. NMS may cause hyperpyrexia, muscle rigidity, delirium, and autonomic instability. If NMS is suspected, immediately discontinue SAPHRIS and provide intensive symptomatic treatment and monitoring. Tardive Dyskinesia (TD): Risk of developing TD (a syndrome of potentially irreversible, involuntary dyskinetic movements) and the likelihood it will become irreversible increase as the duration of treatment and total cumulative dose of antipsychotic drugs, including SAPHRIS, given to the patient increase. The syndrome can develop, after relatively brief treatment periods, even at low doses, and may also occur after discontinuation of treatment. Prescribe SAPHRIS in a manner most likely to minimize TD. If signs and symptoms of TD appear, drug discontinuation should be considered. Hyperglycemia and Diabetes Mellitus: Hyperglycemia, in some cases associated with ketoacidosis, hyperosmolar coma, or death, has been reported in patients treated with atypical antipsychotics. Hyperglycemia has been reported with SAPHRIS. Assess fasting plasma glucose before or soon after initiation of treatment, and monitor periodically during long-term treatment. Dyslipidemia: Atypical antipsychotics cause adverse alterations in lipids have been observed in patients treated with atypical antipsychotics. Before or soon after initiation of antipsychotics, obtain a baseline fasting lipid profile and monitor periodically during treatment. Weight Gain: Weight gain has been observed with atypical antipsychotics, including SAPHRIS. Monitor weight at baseline and frequently thereafter. Hypersensitivity Reactions: Hypersensitivity reactions, including anaphylaxis, angioedema, hypotension, tachycardia, swollen tongue, dyspnea, wheezing, and rash, have been observed in patients treated with SAPHRIS. In several cases, these reactions occurred after the first dose. Orthostatic Hypotension, Syncope, and Other Hemodynamic Effects: SAPHRIS has caused orthostatic hypotension and syncope. Generally the risk is greatest during initial titration and when increasing the dose. Monitor orthostatic vital signs and monitor patients who are vulnerable to hypotension (elderly patients, patients with dehydration, hypovolemia, concomitant treatment with antihypertensive medications, patients with cardiovascular and/or cerebrovascular disease). Use SAPHRIS cautiously with other drugs that can cause hypotension, bradycardia, or respiratory or central nervous system depression. Monitor orthostatic vital signs, and consider a dose reduction if hypotension occurs. Falls: SAPHRIS may cause somnolence, postural hypotension, motor and sensory instability, which may lead to falls and, consequently, fractures, or other injuries. For patients with diseases, conditions, or medications that could exacerbate these effects, complete fall risk assessments when initiating antipsychotics and recurrently for patients on long-term therapy. Leukopenia, Neutropenia, and Agranulocytosis: : Leukopenia/neutropenia have been reported with antipsychotics, including SAPHRIS. Agranulocytosis (including fatal cases) has been reported with other antipsychotics. Monitor complete blood count in patients with pre-existing low white blood cell count (WBC) or absolute neutrophil count or history of drug-induced leukopenia or neutropenia. Discontinue SAPHRIS at the first sign of a clinically significant decline in WBC and in severely neutropenic patients. 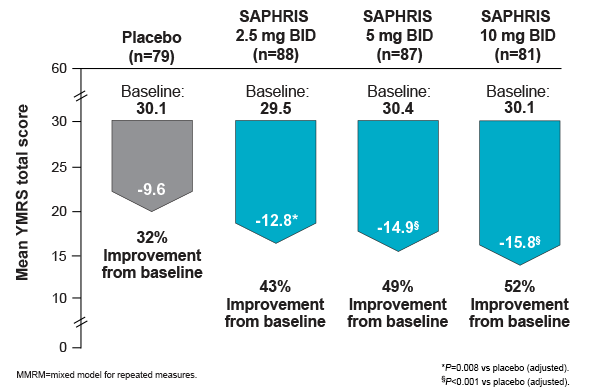 QT Prolongation: In an adult QT study, SAPHRIS was associated with increases in the QTc interval from 2 to 5 msec vs placebo. No SAPHRIS patients had QTc increases of ≥60 msec or a QTc of ≥500 msec. Avoid SAPHRIS in combination with other drugs known to prolong QTc interval, in patients with congenital prolongation of QT interval or a history of cardiac arrhythmias, and in circumstances that may increase occurrence of torsades de pointes and/or sudden death in association with the use of drugs that prolong QTc interval. Hyperprolactinemia: Like other drugs that antagonize dopamine D2 receptors, SAPHRIS can elevate prolactin levels and the elevation can persist during chronic administration. Galactorrhea, amenorrhea, gynecomastia, and impotence have been reported in patients receiving prolactin-elevating compounds. Seizures: Use SAPHRIS with caution in patients with history of seizures or with conditions that lower the seizure threshold. Potential for Cognitive and Motor Impairment: Somnolence was reported with SAPHRIS. Caution patients about performing activities requiring mental alertness (eg, operating hazardous machinery or a motor vehicle). Body Temperature Regulation: Appropriate care is advised when using SAPHRIS in patients who will experience conditions that increase body temperature, eg, exercising strenuously, extreme heat, concomitant anticholinergics, or dehydration. Dysphagia: Esophageal dysmotility and aspiration have been associated with antipsychotics. Dysphagia has been reported with SAPHRIS. Use SAPHRIS cautiously in patients at risk for dysphagia. Drug Interactions: Monitor blood pressure and adjust antihypertensive drugs when taken with SAPHRIS. Based on clinical response, SAPHRIS dose reduction may be necessary when used with strong CYP1A2 inhibitors (fluvoxamine). Reduce paroxetine (CYP2D6 substrate and inhibitor) dose by half when taken with SAPHRIS. Pregnancy: Advise patients to notify their healthcare provider of a known or suspected pregnancy. SAPHRIS may cause extrapyramidal and/or withdrawal symptoms in neonates with third trimester exposure. Based on animal data, SAPHRIS may cause fetal harm. The National Pregnancy Registry for Atypical Antipsychotics monitors pregnancy outcomes in women exposed to antipsychotics, including SAPHRIS, during pregnancy. For information, contact 1-866-961-2388 or http://womensmentalhealth.org/clinical-and-research-programs/pregnancyregistry/. Postmarketing Experience: Application site reactions, primarily sublingual, have been reported (eg, oral ulcers, blisters, peeling/sloughing, and inflammation). Choking has been reported, sometimes associated with oropharyngeal muscular dysfunction or hypoesthesia. In bipolar I disorder: SAPHRIS (asenapine) is indicated for the acute treatment of manic or mixed episodes of bipolar I disorder as monotherapy in adults or pediatric patients (ages 10-17) or as adjunctive therapy with either lithium or valproate in adults. In schizophrenia: SAPHRIS is indicated for the acute and maintenance treatment of schizophrenia in adults. Please also see the full Prescribing Information, including Boxed Warning. The product information provided in this site is intended for US healthcare professionals only. The products described on this site may have different product labeling in countries outside of the United States. 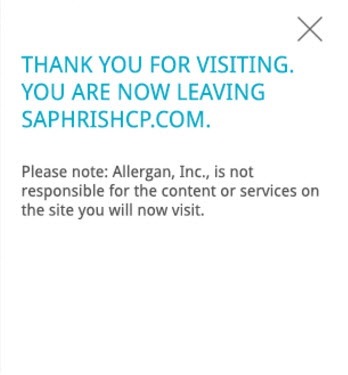 For additional information about SAPHRIS, call Allergan Medical Information toll-free at 1.800.678.1605. You are encouraged to report negative side effects of prescription drugs to the FDA. Visit www.fda.gov/Safety/MedWatch or call 1-800-FDA-1088. © 2019 Merck Sharp & Dohme B.V.; used by Allergan under license. 1. SAPHRIS (asenapine) Prescribing Information. Irvine, CA: Allergan USA, Inc. 2. Findling RL, Landbloom RL, Szegedi A, Koppenhaver J, Braat S, Zhu Q, et al. J Am Acad Child Adolesc Psychiatry. 2015;54:1032-1041 [reprint]. 3. Data on file. Allergan. 4. Young RC, Biggs JT, Ziegler VE, Meyer DA. A rating scale for mania: reliability, validity and sensitivity. Br J Psychiatry. 1978;133:429-435. 5. Spearing MK, Post RM, Leverich GS, Brandt D, Nolen W. Modification of the Clinical Global Impressions (CGI) scale for use in bipolar illness (BP): the CGI-BP. Psych Res. 1997;73:159-171. 6. American Psychiatric Association. Practice Guideline for the Treatment of Patients with Bipolar Disorder. Second Edition. Washington, DC: American Psychiatric Association; 2002. The efficacy of SAPHRIS was based on the YMRS total score, not on any individual component of the scale. For healthcare professionals licensed in Vermont or licensed healthcare professionals who regularly practice in Vermont: Allergan corporate policy prohibits the downloading, printing and/or acceptance of copay cards by healthcare professionals licensed in Vermont, or licensed healthcare professionals who regularly practice in Vermont. Total PANSS scores can range from 30 to 210. The efficacy of SAPHRIS was based on the PANSS total score, not on any individual component of the scale.